The popularity of Jane Austen has grown exponentially over the decades. And it has become a well-known fact that the lady who’s still the undisputed queen of romance has a lot in common with this particular author. Simply put, where both women are concerned, their writing is exemplary. 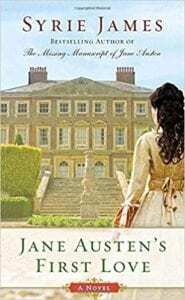 Syrie James has long been a ‘giver’ to Austen fans everywhere, and with this new novel she takes them on a fun adventure back to the early days of Austen’s life. A girl not even old enough to come out in society, Jane is just finding that spark of imagination; that lightning rod of creativity, that she would hone over time to become a brilliant author. Beginning with a letter found by her sister, Cassandra, Jane’s taken back to the first moment in her life when true love stopped her heart. At fifteen, a letter arrives at her home regarding her brother’s engagement and impending marriage. Edward requests that they all come and meet his future wife’s family. Once there, they will take part in a slew of events, including a ball. After convincing their parents that they must be allowed to go, Jane Austen embarks on the best time of her life: the Summer of 1791. The family is walking into an extremely upper-class world and Jane can barely contain herself. Riding toward their destination, the carriage has a slight accident on the muddy roads and a hero suddenly arrives to help. Edward Taylor is an odd knight in shining armor. A handsome boy who loves a challenge, he is not exactly the type to deal with rules and regulations, and has misgivings for what his own future holds. But his interest in young Jane is clear. The pomp and circumstance begins when the Austen clan reach their fancy destination, coming face-to-face with three sisters who seem to spend more time thinking about themselves and what they deserve than thinking about anyone else’s happiness. Unfortunately, Jane relies on the words and facades of the rich, and takes on the role of matchmaker to fix some things that may not be broken. Suffice to say, Jane has her hands full with a play, an error of judgment, and a love that fancies her, yet has another girl waiting in the wings. This is so well-written that true Austen lovers will find themselves smiling at the ‘nuggets’ of famous works spread throughout the story, for example, the matchmaker who cannot leave well enough alone (Emma, anyone?). And even though Jane is still young, the beauty of emotions combined with a humorous atmosphere featuring a handsome daredevil, would make even the ultimate Austen hero, Mr. Darcy, extremely proud to have ended up being a part of his creator’s popular world. And you can bet Jane Austen is somewhere smiling, extremely proud of the woman who sits at a computer and brings her - the woman, the author, and her magic - back to life. Syrie James is magnificent! Quill says: ‘Class-A’ writing is what this author always delivers, and this early Austen adventure is truly unforgettable!